This site describes the features of the Ariel Contact Manager. The Ariel Contact Relationship Management System grew out of the observation that many organisations have shunned commercial CRM systems such as GoldMine and Sage CRM because they are too complex and too expensive. These packages attempt to be all things to all people. However their flexibility and capability mean they are expensive to acquire and set up. Their complexity is quite daunting for some operators – especially the part time non computer literate staff who work for a lot of charitable organisations. 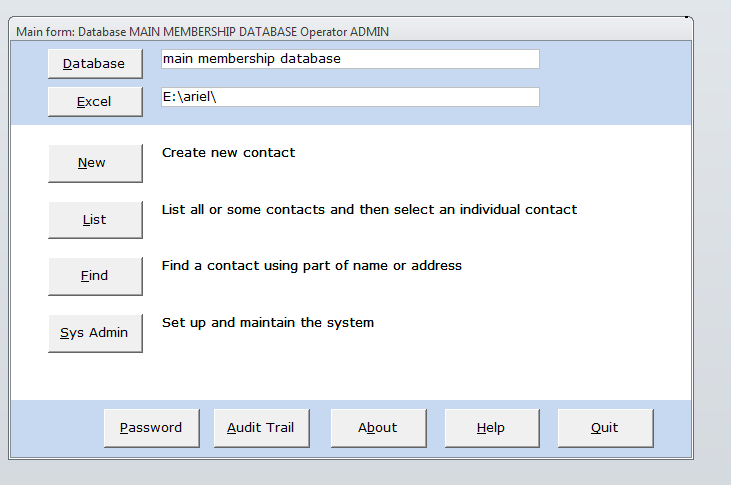 Ariel CRM is designed to fill that space between organisations who do not need the power of a full blown CRM system, but need something better than keeping lists of contacts in Excel, Outlook or a home built system in Access.